A reading of Pinar, W.F. (2005). The Problem with Curriculum and Pedagogy. I originally selected this paper because I was familiar with Pinar’s work (he is currently a professor in UBC’s Curriculum and Pedagogy Department) and his critical position vis-à-vis instrumentalism—that portion of philosophical pragmatism, which took the firmest hold on the educational system in the United States and had the deepest and most lasting impact there. In this essay, Pinar provides some detailed expansion on this criticism through a reading of a 1971 essay by Robert McClintock in the Teacher’s College Record, as well as a reading of Alan Block, a Jewish scholar of ethics and curriculum. Pinar sets up the concept of “study” as a more prophetic and expansive alternative to the stifling instrumentalism of “instruction” as it has been conceived in the mainstream of the curriculum and pedagogy field. Despite his rejection of instrumentalism, Pinar still relies on a pragmatist ethic, borrowed, if not directly from Dewey than certainly from Rorty. And the promotion of “study” as Pinar and Block characterize it, may indeed be one way that a pragmatist ethic may be manifest in the educational system without resorting to the too-narrow conception of education as purely a means to some end. Pinar begins this piece with a discussion of instrumentalism in the philosophy of education. He traces the origin of this instrumentalism, rightly to the progressive movement in education at the beginning of the 20th century. But he also links it to even larger political projects that took hold in the United States then, such as the idea of “social engineering,” which was bolstered, as Pinar argues by the United States’ preoccupation with business and religion (p. 1). The business-mindedness of American culture seeks profit, and the religious aspect of American culture “mangles the present by disavowing it.” (ibid.) In general terms it is this pie-in-the-sky mentality combined with the profit motive and the prevailing instrumentalism that has led to the brokenness of the present-day educational system in the United States. Pinar’s arguments against pragmatism stem from the fact that, as he notes, “Pragmatism’s progressive formulation of social engineering has been eclipsed… by conservatism, intent on side-stepping culture and history by focusing on ‘learning technologies’ such as the computer” (p.68). In the same way that John Dewey relied on the “weakest” form of pragmatism, in his support of the United States’ entry into World War I (mere instrumentalism, according to his famous student detractor, Randolph Bourne), so has the educational system in the United States grown up around certain “scientific” ends in view. And Pinar sees educational policy in the United States, typified by the No Child Left Behind Act, as the result of these tendencies coupled with instrumentalism. This essay is in large part a lament that historically Pinar’s field of curriculum studies has come out of an instrumentalist view of education. Pinar rues the founding of the first Curriculum and Teaching Department at Teacher’s College, Columbia University, where John Dewey was an Emeritus Professor. Columbia was perhaps the epicenter of Dewey’s influence on the philosophy of education. Pinar characterizes the founding of this department —“institutionalized social engineering at the site of the teacher” as a major mistake (p. 68). Pinar is also critical of the centrality of the role of the teacher in education—and argues that this institutionalization of the conjunction of curriculum and teaching “inflated the role of the teacher” (ibid.). From this point in his essay, Pinar introduces “study” as a new subsidiary concept for curriculum—not necessarily as a replacement for “pedagogy” but as a counterbalance to what has become the overwhelming and disturbing centrality of “teaching” in schools. For Pinar study stands opposed to teaching which risks being authoritarian. But study is not just undertaken for the benefit of the individual. Drawing on Montaigne via McClintock, Pinar—wary of those who would mistake autobiography for narcissism— seems to link the “heightening of consciousness” that study brings to a greater social good. The highest good that study brings in Pinar’s view is not the aspiration for “control” over one’s circumstances, as McClintock suggests. Rather, it is study’s “capacity to contest comformity” (p. 69). Thus, after McClintock, Pinar states, “the student draws upon ‘nature,’ ‘faith’ and ‘reason’ as these speak to his ‘situation,’ enabling him to convert the contingencies of time, place and circumstance into ‘achieved intention,’” lending a “creative, singular and social sense” to study (p. 70). But Pinar is still skeptical of progressivism’s ability to “teach freedom for creativity, let alone for individuality and autonomy” (ibid.) Pinar, in a characteristically brilliant turn, points to autobiography as a way forward—the substrate upon which the “mystery” of human capacity for “selection,” “focus” and “judgment” might be borne out. The question remains however: what is necessary of teachers? Maybe just modeling study and the intellectual interest that fuels it is sufficient? On this point, Pinar notes that even critics of progressivism in education acknowledge the role teachers play “in enabling children to discover, articulate, and expand their interests” (p. 74). Thus, in situations where study (not instruction) is central, teachers work to engage each student’s individual curiosity. EDST 580—Entry 3: Richard Rorty’s Pedagogic Creed? A look at Rorty’s Consequences of Pragmatism (1982) alongside Dewey’s My Pedagogic Creed (1897). Apologies in advance. This blog entry will suffer from a lack of specific references to the texts I mention since I am composing this on an airplane flying at 872km/h at an altitude of over 10,000m! My library books have probably all made it back to their stacks by now (save one, which I forgot at my home in Vancouver and was forced to entrust to a housemate to return). In any case, I’d like to use this blog post to think through what Richard Rorty’s pedagogic creed might look like, or indeed whether he would have one at all. And in so doing, I am interested in taking a look at how Rorty’s in some ways more robustly analytical late-20th century pragmatism, benefiting as it has from a paradigm shift away from the logical positivist moment mid-century, which was the demise of late 19th-century pragmatism. John Dewey’s classic, My Pedagogic Creed (1897) is a sparely written, energetic call to action, and one of Dewey’s earliest complete formulations of his philosophy of education. It reads like a political manifesto. And in many ways it was just that, since the major subtext of Dewey’s Pedagogic Creed is an argument for the deeper philosophical understanding of a social and thus political phenomenon—namely education. My Pedagogic Creed is a statement of a younger, “early” Dewey, the Dewey of the Laboratory School at the University of Chicago and comrade of Jane Addams, founder of Hull House. In it Dewey gives voice to a burgeoning philosophy, still very much colored by strong religious sentiment. This is Dewey the activist at his most authentic stage, much freer of the confines of the academy, but also much more idealistic in the technical sense of Dewey’s affinity for Hegelian dialectics. This is a John Dewey less concerned with his reputation as a philosopher, and much more excited about the possibilities held by cognitive psychology and evolutionary biology than in many of his later works, which take a much more “metaphysical” turn. Flash forward nearly more than 80 years to Richard Rorty and the historical moment of the publication of his 1981 collection of essays on philosophy, Consequences of Pragmatism (1982). The philosophical landscape of the 1980s was, as Rorty indicates in the introduction to his book, very different from that of the 1890s. And in a historical account of this span that includes most of the 20th century, Rorty characterizes the ensuing changes as the gradual decline of Hans Reichenbach’s logical positivism to a much less certain moment when the dual forces of “analytic” and “continental” philosophy are squaring off for an attempt at dominance. This state of affairs is much more familiar in the present day. And I think Rorty would argue that there is still a lot of uncertainty about how philosophy will proceed, when it is still so divided into camps of thinkers whose philosophical writing is either more like mathematics or more like literature. Of course, as Rorty notes, there have been exceptions to this bifurcation trend. Rorty mentions John Rawls work in ethics as a specific example of a philosopher whose work continues to be incredibly influential, but which doesn’t fit neatly into either camp. And the question remains: where does pragmatism fit into this scheme. Rorty’s argument seems to be that pragmatism is much more like post-structuralism than logical positivism, especially with regard to the question of truth. Specifically, Rorty as a pragmatist takes up Dewey and Peirce’s insistence that truth is contingent, and only has meaning in terms of strings of observed effects. He also mentions, in one essay, a kind of existentialist leaning which he observes among the early 20th century pragmatists. This link between Dewey and Sartre is one that came up at the 2012 AERA conference in a session I attended. It’s definitely worth further investigation, but honestly I don’t really understand it very well right now. So, the question is then: based on Rorty’s “updated” pragmatism, what might his pedagogic creed look like if he were to write one? Or leaving Rorty out of it for a moment, I might pose the question this way: Is 21st century pragmatism still relevant to the philosophy of education? And if it is then how so? Here is the main way that I think it is. Pragmatism is specifically relevant to the philosophy of education and thus progressive educational practice in its conception of the possible aims of education. Colleges and universities nowadays, with the demands they make of students, teachers and other university workers have lost sight of (if they ever had sight of it in the first place) how knowledge is created and how it changes over time and in the minds of different individuals. Colleges and universities, dominated as they are by conservative political ideologies are much more interested in treating knowledge like a material commodity in various ways—from the way students are tested, to the way teachers are required to publish. Underlying the conservatism of present-day colleges is a demand that knowledge (i.e. truth) be stable. If progress in any domain of human endeavor, whether in terms of social justice, or science or what have you, is still a desirable goal, then universities (and I’m using the blanket term here to signal those individual actors who actually control the levers of power in these institutions) will have to abandon the conception of knowledge as stabile, or truth as anything other than negotiated subjectivities. Rorty’s pragmatism is a philosophy, which is utterly free of the positivism, which defined so much of 20th century thought. 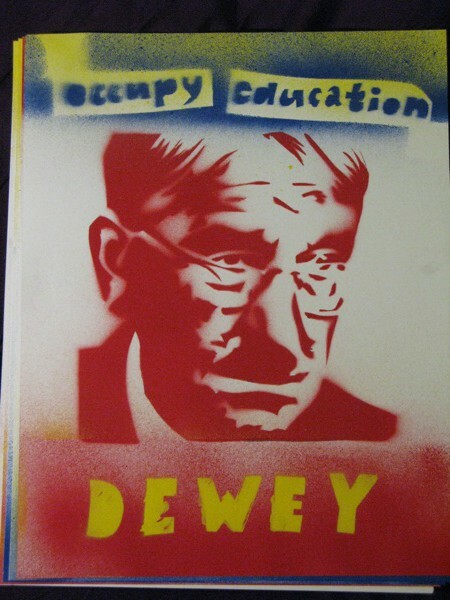 I think that Dewey was perhaps too much in thrall of the technological advances that marked his life in the United States—from flight to mass communication to nuclear fission—to ever distance himself completely from the desire to make his philosophy of education more scientific. And as a consequence, I think what began as progressivism in institutions of higher education has slowly deformed over the course of the 20th century into a system where technological advances (new “instruments,” to use Sidney Hook’s term) are allowed to stand in for learning. In short, I think that if progressivism is to be revived in higher education, it will be through a revolution in the way colleges and universities treat knowledge. The change I am imagining here, which might be described by my own contemporary pragmatist pedagogic creed, needs to take place both at deep structural levels (like on the level of colleges are governed), and at the surface (like in the course of individual human interactions between teachers, students, administrators, etc.). Instead of the dominant pattern of bureaucratic higher education administration, modeled as it has been after industrial capitalism, universities should be much more willing to operate in sustainable fashion with a greater good than just its bottom line. Instead of the relentless drive towards specialization, students should be encouraged to take more holistic approaches to their educations, free from the coercion that the rapidly inflating cost burden of that education has wrought in the United States and Canada. And professors and other researchers should be free to write and teach how and what they believe most deserves to be written and taught, without fear of reprisal, but with sensitivity to the needs and desires of their students. How exactly to realize all of these goals and dreams I have for re-making 21st century higher education in the image of a progressivism that is largely absent now, is an open question. And it is a question that I hope I never lose sight of as a professional teacher. I have a hunch that an anarchist politics, coupled with cosmopolitan world-view informing our ethics, are two more pieces of the puzzle that on first glance seem to fit nicely with the epistemological demands of pragmatism. Perhaps the existentialist piece, which I alluded to above, will fit in somehow as well. One thing is clear: Rorty was nowhere near as interested in actual educational practice as Dewey was. But his more analytically robust, unapologetic pragmatism is already a starting point for the fashioning of my own pedagogic creed. So, this is getting posted a little late, even though I wrote it about a week ago on the plane to Japan. I’m still figuring out when I’m going to be able to make time for the readings I plan to do for the rest of this course. I plan to continue at some point this week with a review of an by Gert Biesta and Siebern Miedema article about the international dimensions of progressivism, specifically in Europe. I’ve been a little self-conscious of my readings thus far avoiding specifically education-relevant discussion. But hopefully, that will change as I begin to get more into the social history of progressivism rather than the philosophical underpinnings of it, which is what I feel like I’ve been (mostly accidentally) concentrating on lately. Meanwhile, my week-old son, newly arrived from the hospital is a constant distraction as well as a constant motivation and inspiration for this work. HaroldBloom – On The Auroras of Autumn by Wallace Stevens – YouTube. Extremely quirky physical expression in this performance of literary criticism. I have tagged this “EDST 580” with this intention of using it as a counterpoint to an short essay about a discussion in a 1970 manuscript detailing the oeuvres of four pragmatist philosophers and opening the introduction to his manuscript from a quotation from another Wallace Stevens poem which originally appeared in publication with “The Auroras of Autumn” (below) in 1950. I agree with Bloom that this is Stevens at his best– probably Harold Bloom at some of his best too for that matter… but the author, Charles Morris, of the history of philosophy… not so much… READ ON>> for more context.